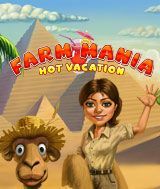 Download Farm Mania Hot Vacation for free at FreeRide Games! 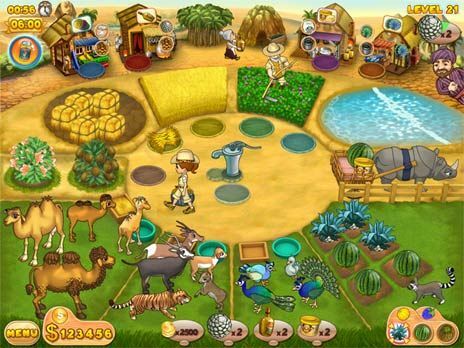 After saving her grandfather's farm and restoring a run-down ranch, Anna is back for more farming mania in another installment of the classic Time Management series, Farm Mania: Hot Vacation. This time, Anna goes on her best vacation ever as she travels to Egypt, Australia and China to take part in farming competitions, and of course she needs your help to conquer the mania once again. In each of the country's she visits, you'll encounter different local farm animals and exotic plants, and there will be different products to sell. Help Anna deliver food and water to animals, tend to crops, and collect products while her grandfather prepares food and tends to trees and bushes, her grandmother cooks or prepares more complicated goods and Bob cuts trees and mines gold and coal. Then buy new crops, animals and enhancements for your farms and watch them thrive! Large number of animals, crops, upgrades and enhancements.